The world of Shojo Manga art dares the artist to go all out - big eyes, colorful skin tones, spiky hairstyles, funky clothes and settings - the works. This book shows how to take full advantage of that freedom while bringing believability and originality to Manga characters. 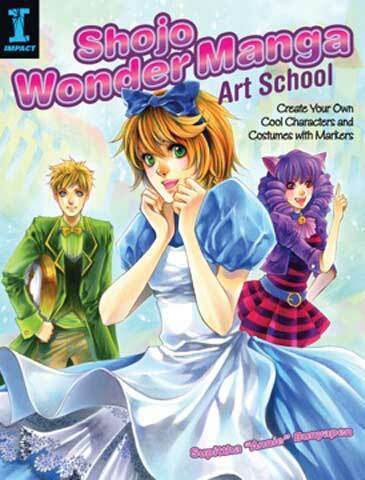 With easy-to-follow, step-by-step instruction it shows readers how to draw a wide range of characters in the manga style including heads and figures, attitudes and expressions, clothing and natural and dynamic poses. It also includes tricks for building mood with shadows, light and expressive color. The book contains more than 20 step-by-step demos that cover an assorted cast of colorful characters, including six complete scenes with finished backgrounds. Color-mixing charts and step-by-step demonstrations for mastering basic skin tones, instruction on drawing heads, figures, clothing, accessories, poses, hairstyles, costumes and backgrounds and coloring techniques for refining your illustrations and mixing markers with other media to create cool effects.